Check out the Duvall website to see exterior structures. 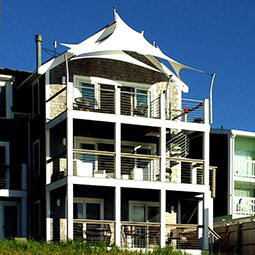 Transformit has teamed up with Duvall Design to create world-class exterior tension-fabric structures. Sharing a common vision for the creative potential and capacity for artistic expression inherent in tension-fabric structures, Transformit and Duvall Design create textile elements of the highest quality, carrying a common aesthetic throughout interior and exterior environments. and are executed on schedule and on budget to offer a lasting value.